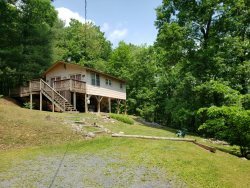 This property is located North/West of Luray, off South Page Valley Road Luray, Virginia. It is about 8 miles to the town of Luray. A Lazy River Cabin is located at the end of a cul-de-sac, on a hill top with panoramic views of the mountains. Relax in the hot tub under the stars on a spacious sun deck with a BBQ grill. Use the campfire area to roast hot dogs or marshmallows. The Thornton Gap Entrance to the Shenandoah National Park/Skyline Drive is a wonderful way to view the Virginia wildlife and it’s about 25 minutes away. Luray Caverns is a 7-mile drive, and The George Washington National Forest Storybook Trail is only a 15-mile drive. Massanutten Resort “A Four Seasons Resort”, Massanutten Water Park, and the Massanutten Ski Resort are 30 miles away. Stayed here with a group of 8 friends for a weekend getaway. Cabin was very clean and cozy and had plenty of room for our group. We also enjoyed the hot tub, grill, and fire pit. Host communicated well and made sure we were set up for our weekend. Would love to come back and check it out again in the summer when the weather is nicer! We enjoyed our stay at the Lazy Cabin. Though it was our first time at this location,we had a great time.The mountains were breath taking.It was perfect for our Honeymoon! We love A Lazy River. This is our 4th or 5th time here. It is a nice cabin with a great location. Please be advised you have rented a mountainous property. The main and secondary roads are usually paved. During inclement weather such as snow or ice we also recommend Travel Insurance during these months. We do not give refunds for road conditions that are out of our control.